Actually manufactured in the USA! Not all reflective radiant barriers are created equal. ARMA FOIL™ Radiant Barrier is produced using the most technologically advanced processes in the industry. The proprietary method used to create ARMA FOIL™ yields a material that is lighter, yet resists tearing better than every other code-compliant radiant barrier on the market. While our competition may tout their products' weight, we contend that just because something is thicker or heavier does not mean that it is stronger. As you can imagine, there are several real benefits to using a reflective foil material that weighs less without giving up any tear resistance. Heavier foil insulation rolls are much more difficult to work with in confined areas, especially in attic spaces. In addition, heavier packages cost more to ship and tend to get a little more banged up in route. ARMA FOIL™ is double-sided, tear-resistant, Class A/Class 1 Fire-Rated using the newest code / testing procedure, clean, non-toxic and much more... Watch our videos below to get a better picture of what makes ARMA FOIL™ reflective foil insulation roll different than the others. Other radiant barriers are made by laminating foil or film to a plastic lining. This older lamination process has a few inherent problems. ARMA FOIL™ is made using an entirely new technology eliminating the lamination process and all its related problems. ARMA FOIL™ is available in several new widths including: 51", 25.5" and 17". These widths make installation on 16" and 24" joist spacing a lot easier. The proprietary process with which ARMA FOIL™ is made allows us to provide a material that is both lighter weight and resists tearing much better than Polyester (PE) based materials. Since this reflective foil insulation is not heat laminated, it does not suffer from the memory effect and it does not become brittle and zipper from a tear or staple. 97% vs. 95%, why the difference? If a radiant barrier boasts a 97% reflectivity, it is not coated to protect against the oxidation which forms when aluminum is exposed to the heat and moisture found in an attic. Oxidation is an invisible layer that builds up on the surface of the foil and significantly lowers its reflectivity. ARMA FOIL™ is coated to prevent oxidation and ensure that it reflects 95% for years to come. The term "made in the USA" has different meanings to different companies. When we say "ARMA FOIL™ is made in the USA," we mean it. Here's what our contractors are saying about ARMA FOIL™. "I love the 51 inch width!" "ARMA FOIL™ is stronger than other materials we've used in the past." "The lighter weight makes it easier to work with." "We are shaving 5 to 10% off our install time." "Lighter is better when it's stronger." Radiant barriers are starting to become common place in building construction. Whether you are building a new home or live in an older home, it is never too late to add a radiant barrier and start saving energy. Since installing radiant barrier is an investment in both time and money, be sure to pick a material that will hold up over time while maintaining its stated reflectivity. When installed properly, our highly reflective foil is extremely effective at reducing both the heat gained in the summer and lost in the winter to make your home more comfortable and save money on utility bills. 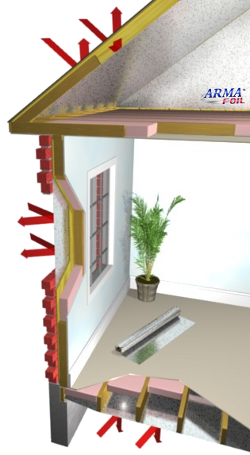 Learn more on how radiant barriers work. If you have any questions about your radiant barrier project or any of our other products, please call us at (972) 499-4550 or toll free 877.464.5828. You can also send us an email or check the FAQ.